Very informative site on Panzertruppen and vehicles. Highly recommended. Angus Konstams world of wargaming. Andrew's work is superbly finished with a painter's eye for detail, a modeller's creativity & imagination and a gamer's practicality.Andrew is without doubt one of my favourite painters and I consider his style to be unique and extremely difficult to ape. He also believes he is Captain Willard! 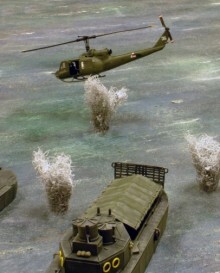 Dave Schmid's fantastic model planes compliment perfectly 15mm FoW vehicles and figures. His site is currently being updated and there are far more models than currently listed I believe. Prices are great and he is very interested in what his customer's are interested in! The very talented ARTMASTER STUDIO TEAM who now have a big reputation for quality in the figure painting world.